The ‘RNA world’ hypothesis that proposed RNA molecules as the first form of genetic material was put forwarded in the late 1980s but got impetus only recently when high-throughput sequencing technologies began unearthing new types of non-coding RNA (ncRNA) transcripts in higher eukaryotes. Till then, research on ncRNAs were primarily confined to transfer RNAs and, ribosomal RNAs, which act as the messengers of the protein synthesis and allow translation of genetic information encoded by DNA into proteins. In recent years, the integration of high-throughput genomic technologies with molecular biology and omics sciences have revolutionized the fields of ncRNA research by identifying the hidden treasures of several new types of ncRNAs encoded in the genomes of several organisms and decrypting their versatile roles in gene expression and epigenetics. Among these, two small endogenous ncRNAs, namely microRNAs (miRNAs) and piwi-interacting RNAs (piRNAs) that drive argonaute (AGO) family of proteins namely Ago and Piwi respectively and silence the expression of genes have geared up molecular and disease biology research in recent years. Both miRNAs and piRNAs are expressed in higher eukaryotes, including human and act as cellular rheostats by regulating the expression of significant fraction of genes encoded in the genomes. The aberrant expressions of these small ncRNAs within the cells cause various abnormalities and diseases including cancer. Manipulating their aberrant expression or function can serve as potential novel diagnostic/prognostic biomarkers and bring in new therapeutic strategies for multiple human diseases. This can be further translated from bench-side to clinic for improving human health. This book captures the essence of the pioneering work of some of the world’s leading researchers showcasing the scientific excitements surrounding the evolving regulatory roles of miRNAs and piRNAs highlighting their potential towards the diagnosis and therapeutics of various diseases. 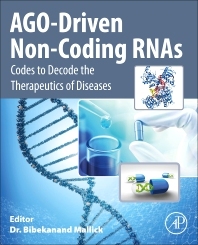 The book is geared towards scientists, students, and will particularly appeal to active investigators in RNA biology, molecular biology, cancer research as well as clinicians and will provide them a comprehensive view of recent discoveries and research progresses to utilize miRNAs, piRNAs and their interacting proteins, Ago and Piwi for diagnosis, prognosis and therapeutics of diseases. Dr. Bibekanand Mallick is Associate Professor and Head of Department of Life Science at National Institute of Technology Rourkela, serving since 2009. He has excellent academic career from reputed alma mater viz. Indian Institute of Technology Kharagpur, Indian Association for the Cultivation of Science, Kolkata and Wadsworth Center, New York State Department of Health in United States. He leads ‘RNAi and Functional Genomics’ Laboratory at National Institute of Technology Rourkela and conducting wide-range of research on various aspects of non-coding RNAs that include miRNAs, piRNAs, lncRNA as well as their crosstalks (ceRNAs) and their regulatory impacts on diseases like cancer and neurodegenerative diseases. He has published several research papers in highly reputed international journals and books from publishers of repute like Oxford and Springer-Verlag in his academic career. Recently, he has been honored as Member of National Academy of Science, India (MNASc) due to his significant augmentation to understand the dark matter of RNA world.